I first met Rob through friends of friends while watching Everton play away in Lisbon a few years ago. With a few notable exceptions, football trips abroad aren’t usually known for their abundance of vegan food – in fact, it’s a lucky day if you manage to stumble across any solid food at all amongst the sea of alcohol. Food wasn’t discussed. Over the next months as I bumped into Rob at militarymovers.co military moving companies and at other matches and became his friend on Facebook, I noticed that he’s a bit of a food geek as well. He eats meat but he spent a short time challenging himself to eat vegetarian and one of his Facebook new year’s resolutions this year is to eat less meat. When I spotted the above picture on his twitter account, I sniffed vegan food a mile off and asked him if he’d mind sharing his recipe here, as part of my irregular series of posts from non vegans. Chop the squash into inch cubes (I always leave the skin on, adds another texture and flavour), oil, salt and roast in the oven for 15mins at full temp so that the squash is coloured but not quite cooked all the way through. Blitz together in a food processor peanuts, red chilli, ginger, garlic, spring onions, lime zest, soy sauce and a bit of water to get the consistency of a loose paste. Fry off in some inoffensive oil to cook out the rawness of the garlic and add some coconut cream/milk and a bit of water. Add the squash and leave to finish cooking all the way through. About 3 mins before the end add the beans (I think runner beans are best but couldn’t get any) to retain their crunch. Season if you need to, but the soy and chilli should have done the job. 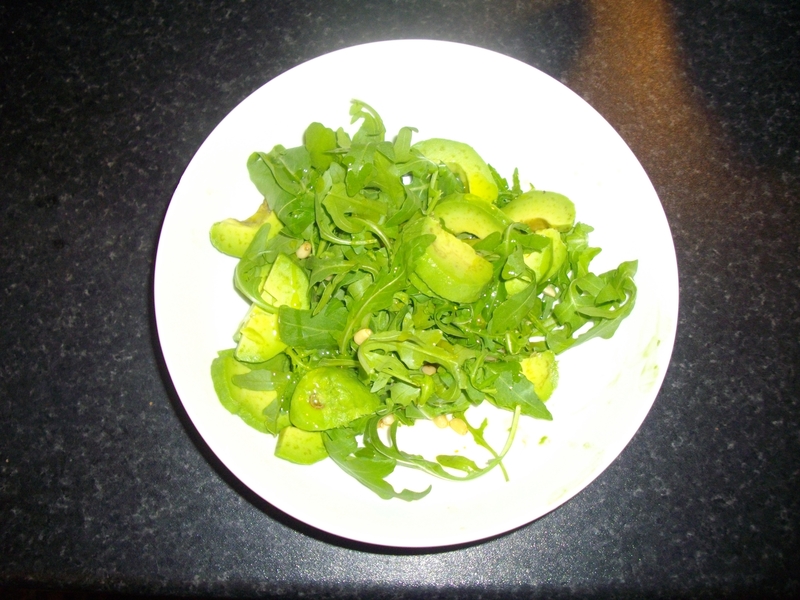 Finish with lime juice and coriander to taste. Serve with rice and toasted cashews. Thanks Rob, and I look forward to more vegan food adventures from you! Another friend took me up on my October vegan challenge! I know Rachel can cook brilliant vegan food because she’s done it before but I was curious to see what she might cook for her family if I wasn’t there. She did cheat a bit because she waited until her notoriously meat loving husband was away, but since she’s got 3 young children including very active twin boys, I’m full of respect that she eats anything that isn’t a pot noodle. Ha, she’s got the same dishes and nearly the same worktop as me but I swear she took these pictures and sent me them! 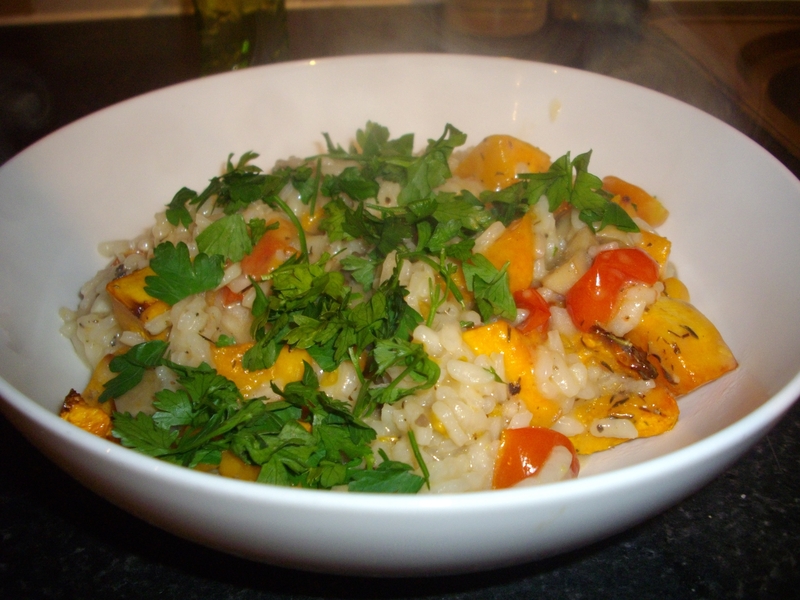 Put simply (and to be fair it had to be simple as I got back from helping at Beavers at 7.15pm and had to look in the fridge for inspiration…) it was a load of butternut squash chopped up and roasted with olive oil and thyme for half an hour at about 180. 10 mins before the end I chucked in some halved cherry tomatoes (about eight). In the meantime, I fried up some mushrooms and garlic in olive oil, added my risotto rice and then my veg stock, salt and pepper. 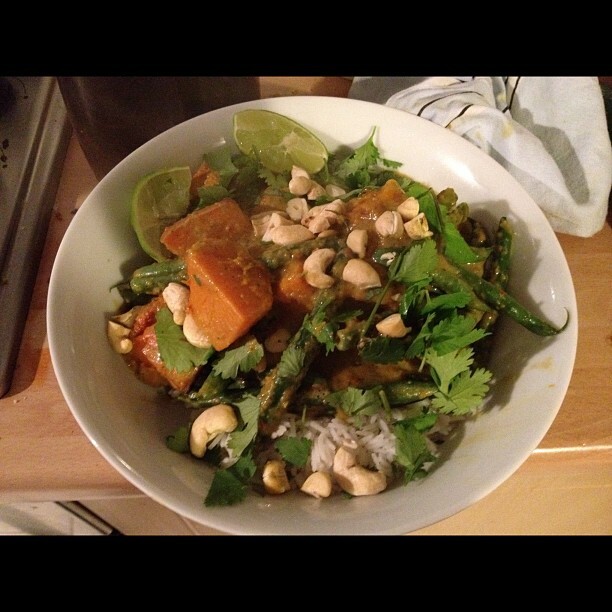 2 mins before it was ready I chucked in some left over coconut milk from a Thai curry from late last week….. Twas delish with a salad of rocket, toasted pine nuts, avocado and a smidge of sherry vinegar and olive oil. Infact, I couldn’t eat it all! Well, I’ve been cooking vegan food for a long time now but I don’t think I could come up with that at the end of a busy day. Thanks for taking the challenge Rachel! Maybe one day you’ll dare to feed vegan food to your husband?? ?